The trees stand naked now–other than a few stubborn brown oak leaves insistent on hanging to their keeper, pretending they are Spanish moss on old Southern live oaks but looking more like soggy bits of brown paper bag scattered by a gusting wind and caught by outstretched branches. Who do they think their fooling? I have been nervous for fall to end here in the mountains. Last year at this time, our family was making our first exploration of Roanoke. We came in on a Friday evening, when all we could see were lights—lights giving shape to downtown buildings and streets, then scattering off and up into the blackness. Lights…and the famous Roanoke Star suspended in mid-air, reminding me of a giant nativity scene star, only I couldn’t see it lighting up the Baby Jesus below. 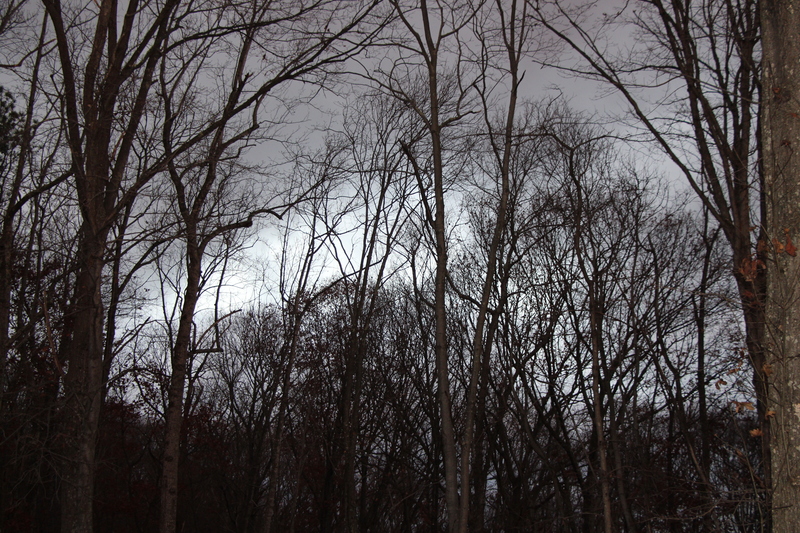 The next morning I woke with a small knot my stomach and urgent desire to see Roanoke by daylight. I pressed my forehead against the glass and craned my neck as far as the double-wide window would let me. It was a fairly clear day, the clouds were thin and hazed slightly across the front of the hills causing the landscape to take on a veiled gray. Is this what the mountains of Southwest Virginia looked like? They were so…bare. So blah. Is this where we were considering for our permanent home? Where was that star I saw last night, anyway? That little stomach knot never really left throughout the weekend. Whether we were driving around town considering neighborhoods or driving around mountains to appreciate the views, all I could see were naked trees and the exposed hills on which they stood. I felt slightly embarrassed to catch them so unguarded. Each time we came back to Roanoke after our first visit it was the same—brown, veiled, sometimes misting, one time blowing snow at the top of a mountain where we were viewing a home half-constructed while it rained in the valley below us. I didn’t see Roanoke green until the day Superman and I came to close on our home. Of course my mind knew that logically Roanoke couldn’t look dead forever. I knew green would come, the trees would burst forth their annual adornment, plants would wake up, boast their colors, display their showy blooms. But my soul had to keep reaching for faith. I struggled to see past the bland. I fought to remember the promise and not be overwhelmed by the immediate. When we did finally come to stay I entered into the landscape’s transformation post factum. We missed the awakening. Again, I wrestled for faith that there had been a working—a process into glorious spring. Now I look out my back dining windows at the stark late-autumn forest surrounding me. I see the backs of homes previously hidden, formerly known by the barks of their dogs and squeals of their children. My eyes follow the slope from my patio’s edge to our invisible property line. I hear the crack of a breaking branch or tussle amongst the fallen leaves and can sometimes spy the culprit before it scurries away deeper into the woods or under our forest’s leafy carpet. And yes, I see the naked trees. But, rather than see them starkly, I see them in their intimacy. I notice the deeply scarred rough skin of the oaks; the way they stand strong and straight, exposed but determined to anchor the forest floor. I see my sweet dogwoods–still straggly, still the wild-hairs of their front yard siblings–with all their branches turned upward creating open hands as if they purposefully held their gifts up in sacrifice, releasing their foliage to the One who so graciously gave them their wild life. I follow the shapes of the splatter-painted lichens, wondering by what strange miracle a fungus can appear as ornamentation to tree trunks. I don’t see only hues of brown and gray as I did last year. I don’t see a veiled setting around me. Rather I see its beauty, its openness, its pure unadulterated presence. I was nervous about the end of autumn. But somewhere in the holiness of nature putting herself to sleep and entrusting herself to me in the months of her slumber, I forgot to keep hold of my fears and now feel only thankful to have won her confidence and her affections.